Concept: 9/10 This review is for the 2nd game in the Lufia series. Although, chronologically, the events in this game take place before the events in Lufia & the Fortress of Doom. Which we reviewed by the way over here in our Lufia and the Fortress of Doom Review. The 2nd game improved upon many aspects of the original including some pacing issues with the story and enhanced graphics, more challenging puzzles to solve, and no more random encounters. The story in Lufia 2 Rise of the Sinistrals takes you back to playing as Maxim and the original heroes who helped defeat the sinistrals as shown briefly in the prologue of the first game. 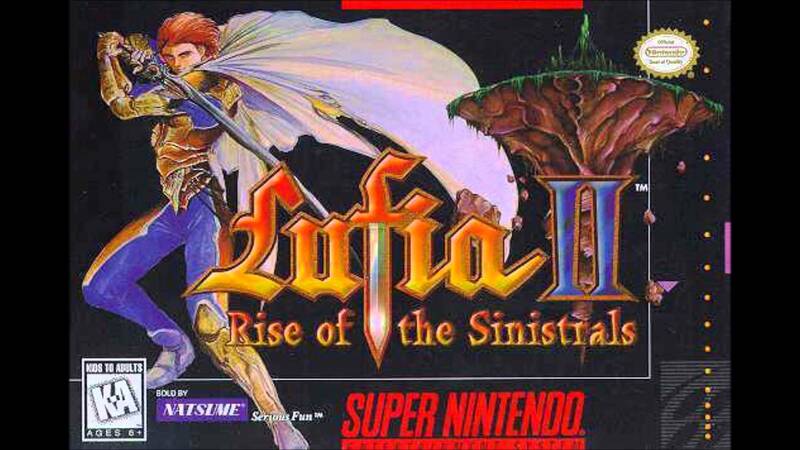 Like it’s predecessor, Lufia II: Rise of the Sinistrals also includes some dungeon crawling and adds a new monster taming mechanic, but the game is largely a traditional turn based JRPG with colorful graphics, endearing characters, and a heart warming story. Story: 8/10 You play as Maxim, a bounty hunter, living in the town of Eclid. His childhood friend, Tia, who runs a shop where Maxim receives new orders and turns in his bounty to be paid worries about the recent increased occurrence of monster attacks near the village. Maxim soon learns from a strange woman named Iris that these attacks are no mere coincidence and that he is “fated” to save the world from evil and thus sets out on a journey to a floating citadel to defeat the sinistrals. As for “plot” this is all that is really “presented” to the player; it is bare bones at best…. but is plot really the only driving force in creating a good “story”? No, it’s not; because the characters themselves are equally as important as their settings and surroundings. There are numerous plot twists which emerge later in the game and many different playable characters who all feel very real because of the way character interaction is handled within this game. The story is less about saving the world, and more about the bonds that are formed along the way between Maxim and his comrades. It seems as if “real” relationships are formed (and sometimes cruelly ripped apart, just as love can be fleeting also in real life). There is death, there is pain, and most of all, there is love, because love is the most important thing in the world. You will experience all of the emotions that the characters are feeling and you will be surprised and shocked a few times along the way as well. Because of it’s excellent character interaction and the way in which the story builds upon the relationships of the different characters, this saves what would otherwise be a fairly run-of-the mill plot, and instead turns it into one of the most touching and memorable experiences on the SNES. Characters: 10/10 As I mention above, the characters themselves are what keep you engaged in the game’s plot. They seem like they are as real and troubled as many people that we personally know in real life. The drama can be over-the-top at times, but I like a good drama, so for me, that’s not an issue. The characters fight amongst themselves, deal with secret feelings and desires, have conflicting emotions, objectives, and they grow and evolve throughout the game, coming to reconcile their differences and sort through their emotional struggles. Gameplay: 8/10 If you enjoy the puzzles in games such as Zelda or Alundra which force you to think outside the box, you will also enjoy the puzzles in Lufia 2. Lufia is well known for having some of the most challenging puzzles for it’s time (I found them much more abstract and challenging than Zelda a Link to the Past which released around the same time). The ability to see monsters on the screen also gives you an element of strategy in your gameplay as you can surprise them to take the advantage or avoid combat to travel more swiftly. Though this mechanic is commonplace in RPGs today, I do believe Lufia 2 was one of the first games to shift away from the random encounters that were prevalent in most RPG back in the late 90s. Other noteable features include the capsule monster system which allows you to gain a 5th (all be it, computer-controlled) party member which you can “raise” in a virtual pet sort of way by “feeding” him items and equipment that you no longer need. The monsters would evolve in various ways and multiple times, getting increasingly stronger and aiding you further in battle. Also, as in all Lufia games, the ancient cave returns providing an (almost) endless and optional dungeon crawling experience to obtain the best loot in the game. Lufia 2 introduces an “IP” system, where as you battle, your IP gauge begins to fill, and upon filling, you can unleash powerful skills. These skills are often obtained by equipping special items (like those found in the ancient cave). The one caveat that people like to pick on is the amount of “fetch” styled quests (many of which are optional) (but some that are required to advance the story). That is, quests which are not “story” driven and merely “go here, kill x monsters, or find x items”. While these quests aren’t very innovative, they are a commonplace mechanic in most JRPGs. Graphics: 8/10 The colors are much richer, and there is a wider range of textures and tile sets used in Lufia 2. It addresses the main critique of Lufia 1’s graphics as being reused and dungeons and towns all looking and feeling similar to one another. I enjoyed the super flashy “anime” style colors and enjoyed the large areas that were used for various towns, making them feel more alive than it’s predecessor. The character sprites although not overly detailed are cute and keep with the same anime vibe. The combat screen in Lufia 2 is much better; where as in Lufia 1, you see your characters primarily represented as stat bars, in Lufia 2, the characters are present on the battle field, as in most other RPGs of that era. Lufia 2 is definitely on equal footing with most late 90s RPGs in terms of graphics and presentation. Music: 7/10 Lufia 2 is often complimented for it’s very large soundtrack. Aside from the first few dungeons, other tunes are seldom reused. When you enter a new area you hear new tracks; and the tracks used vary widely from upbeat peppy tunes to sweeping ballads. However, I find very few of these tracks to be very memorable when compared to other RPGs of the 90s. The music is “good” but not “great”. There are also a number of different sound effects which add an additional depth of immersion to the game world. Replay Value: 4/10 Lufia 2 has a replay mode that allows you to earn increased XP and Gold on multiple playthroughs; however, it’s a completely linear game, so the story never changes. There are still some interesting side quests and gameplay elements that could keep people coming back to find everything this game has to offer. Replay value is minimal; although I have personally replayed this one many times, because it’s just so fun and the storyline is so touching.